Wild Planet Tuna Sriracha Burger - A recipe from Savor California, the online showcase for extraordinary gourmet foods and beverages from California. Place tuna and juices in a large bowl and break into larger chunks. Add in the rest of the ingredients and fold together. Spoon the tuna burger mixture into a ½ cup portions and gently form into patties. Place patties onto a large oiled skillet or pan on medium heat. Cook for 4-5 minutes on each side, or until golden brown. Mix 1 tablespoon of sriracha and 2 tablespoons of mayonnaise. Spread the Sriracha Mayo onto the toasted bread buns. 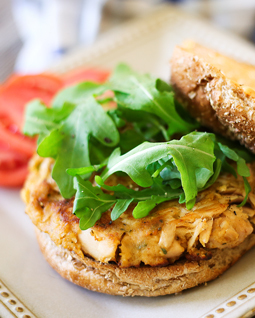 Add the tuna patties and top with sliced tomato and fresh arugula.